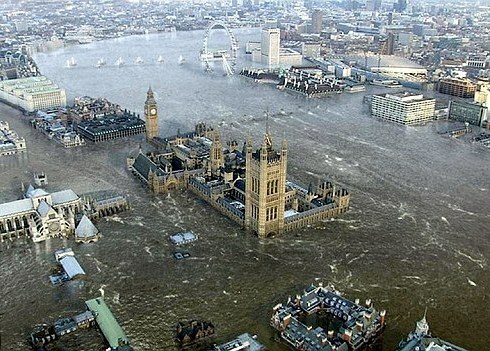 A scene from the 2007 disaster film Flood showing central London flooded by an extreme storm surge. For some people, one of the consequences of global warming, almost unnoticed by the rest of us, is already upon them. The seas are rising, and this affects human populations living in low-lying coastal regions and on islands. While studies show that sea levels for millenia changed little until 1900, they began to climb in the 20th century. The Intergovernmental Panel on Climate Change (IPCC) projected in 2007 that during the 21st century, sea levels will rise another 18 to 59 cm, but these numbers did not include the impact of melting ice. More recently, the US National Research Council suggested in 2010 rises over the same period of between 56 and 200 cm ie. between half a metre and two metres. Future sea levels are notoriously difficult to predict, and different studies can show different results, but in all cases sea levels are going to rise. This rise in sea level is a result of the thermal expansion of water due to the higher air temperatures, and the melting of land-based ice like glaciers and ice sheets, both stemming directly from man-made global warming. In addition, it may be that the seas are absorbing more of the heat of the atmosphere than was forecast. This may explain why the rate of increase in warming of the earth’s atmosphere has slowed in the last decade, but the sea is rising faster as a consequence. The effect of rising sea levels is not felt equally across the globe. Ocean-borne storms and surges exacerbated by global warming can raise sea levels much higher than normal, causing sea water to flood inland over wide areas destroying urban development, or arable land through salt water contamination. The destruction of mangrove forests in coastal areas by human activity can dramatic alter the impact of rising sea levels. Coastal land can also be inundated or eroded far quicker where there are little or no sea defences or where rocks are softer. If sea levels continue to rise, quite a number of cities, let alone thousands of smaller centres of population, are threatened this century by rising sea levels: Guangzhou and Shanghai (China), Alexandria (Egypt), Calcutta and Mumbai (India), Venice (Italy), Osaka-Kobe (Japan), Bangkok (Thailand), Boston and New York (USA), and Ho Chi Minh City (Vietnam). Longer term projections that contemplate the melting of the Greenland ice sheet, would lead to a rise in sea level of seven metres, enough to submerge hundreds of cities worldwide including London and Los Angeles. In Bangladesh, one of the world’s poorest nations, agricultural land up to 100km inland has already been damaged by storm surges, and it is projected that a 1.5 m rise in sea levels would affect 17 million people and 16% of the landmass of the country. The Ganges delta is the largest river delta in the world. 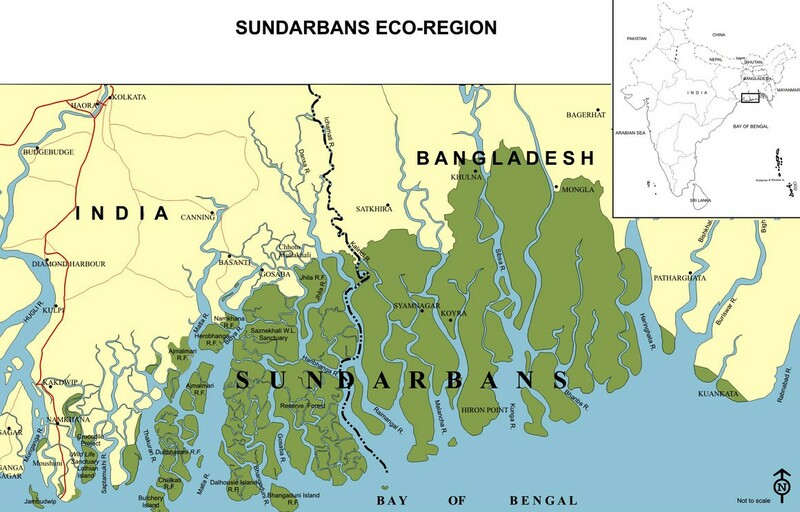 Much of the part that lies in Bangladesh supports one of the most densest human populations in Asia, the Sundarbans mangrove forest. It is projected that 75% of what remains of the forest will be destroyed by 2100 as a result of rising sea levels with a devastating impact inland due to flooding. Already two islands have disappeared. On the other hand, in the Netherlands, where 26% of country is below sea level and vulnerable to flooding, a massive building program is being considered to strengthen the country’s water defences against a rise in the North Sea of 1.3 metres by 2100 and 4 metres by 2200. 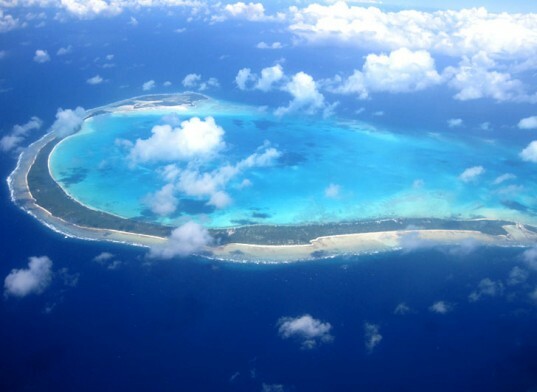 One of the many atolls in Kiribati in the Pacific Ocean, which will be submerged as a result of rising sea levels. Across the world however, small communities are already being destroyed.